"Keep close to Nature's heart...break clear away, once in awhile, and climb a mountain or spend a week in the woods. Wash your spirit clean." Or so said John Muir, the Scottish-born American writer and conservationist. Having just spend three days doing day-walks in the Blue Mountains, I couldn't agree more. The days were clear and cool and in the evenings my wife and I retreated---with spirits washed, dried and neatly ironed---to a log fire in a cottage to read and listen to the possums scurring across the roof. Okay so the logs were fake and it was a gas fire but it was still warm and toasty. We are lucky in Sydney to be so close to so many national parks including: Ku-ring-gai Chase, Royal National Park, Lane Cove National Park, Sydney Harbour National Park and theBlue Mountains National Park where we were. And being there mid-week when it wasn't school holidays, we had it all to ourselves. Much as we love the city, it is good to get out into nature and replace the city's sounds with bird calls. The only high-rises in sight were built by termites. It was also a good time to try out my new digital camera. Try as I did to get a good photo of a Supurb Lyrebird--and there were plenty of them about---all I managed was one blurry photo. (One of these days I'll read the manual and learn how to use the camera properly.) But, feeling sorry for me, various other birds came by and posed, including some Sulphur-crested Cockatoos and a male and female Australian King-Parrot. 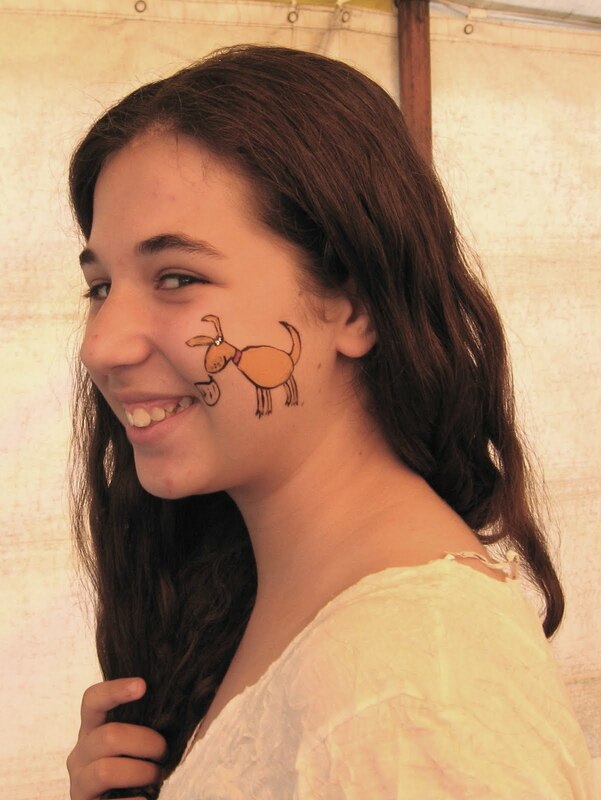 In my previous post, on the Norman Lindsay Festival in the Blue Mountains, I omitted to mention all the fun things the Festival provided for the kids on Sunday, the kids day, including some very creative face painting. Yes, there were the usual cat faces etc but this was the first dog face I'd seen. Certainly the first Selby face. Lincoln Hall (in green in the photo) was in the news a few years ago when he "died" on Mount Everest. At least he was left for dead but revived in the night and was eventually rescued. He's written extensively about this as well as other high-altitude mountaineering adventures. I've always been fascinated by mountains and mountaineers. 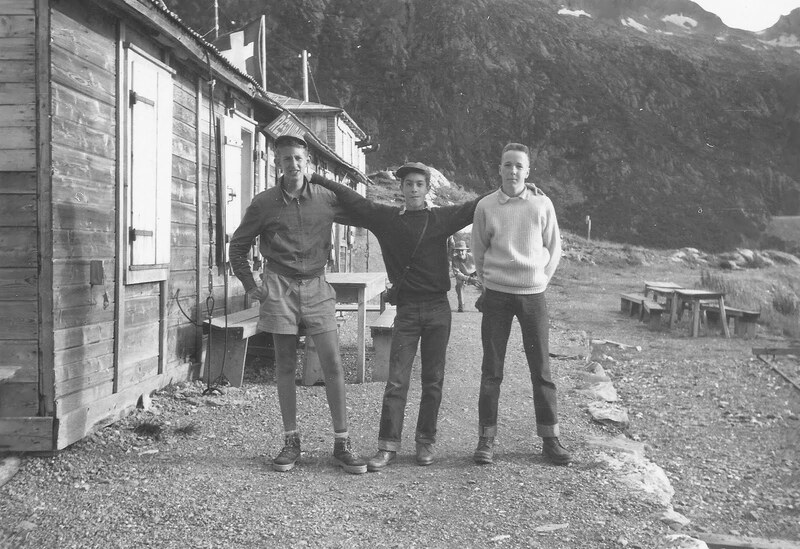 Here I am hiking with two friends in Switzerland at the age of fifteen. I'm on the right in both photos. (Tell me I haven't changed.) 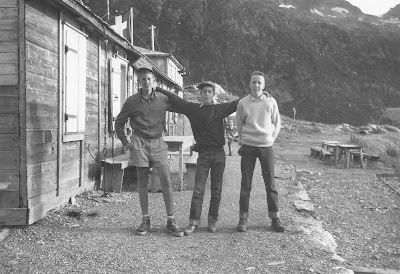 These days I'd rather enjoy the mountains from the warmth and safety of my loungeroom curled up with a book like Lincoln Hall's harrowing account of his near-death experience, Dead Lucky.